Forever This Timeis the story of Josie Kendrew, who returns to her tiny Vermont hometown after ten years' absence when her father has a stroke, and Ethan Miller, her jilted high school sweetheart, who's taken her place as the CFO of the Kendrew family business: running Snowflake Village—a "Santa's Village"—style amusement park. Forever This Time is the beginning of a new series set in Echo Lake by Maggie McGinnis. There were parts of this book I really liked, and then there were some aspects that just didn't draw me in totally. Josie has been away from her home town for about ten years and in the meantime she has trained and become a counsellor. She has gone into partnership with a friend and it seems to be doing well. However when she receives a call to say her father has had a stroke she returns home. Josie grew up with an alcoholic mother and a Dad who was more absent than present, so she had a rough childhood. The kindness of the people in the town who looked out for her were most likely her salvation. She was a Big Sis to Avery, a little girl in a foster home, who then died of cancer and broke her heart. Fearing her relationship with Ethan was going to lead to the kind of life her parents had, she decides to call off her marriage to him and go to college and put off marriage. Very sensible at eighteen I thought. Yet she never goes back and her friends don't pursue her. On her return I was not impressed by Ethan's behaviour toward her initially. Nor did I like Molly her friend who just seems so unforgiving and mean. Thank goodness her Papa and Mama Bellini had some sense in the matter and reached out to Josie. No, never warmed to Molly, even with her last suggestion that seemed so generous. Josie's parents - things have changed in their lives, it had the promise of some depth, but the book never got there in exploring those issues and the impact on Josie herself. Ethan has made a real success of his life and has led a really wonderful initiative. He does have a heart of gold but when it comes to Josie and his slow outreach to her, I wasn't so sure. I just didn't 'feel' the largeness of heart, until too late. 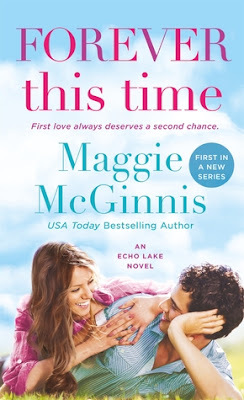 This was my first read of a book by Maggie McGinnis, there was enough in the book to like, so I would certainly pick up another book by her. oh its a new series, awesome. I am not curious about Ethans actions. Never heard of this author. It might be a book I would read. Glad you liked it! This one is new to me, and I like that it's the first in a series. It sounds like one I'd enjoy, except characters like Molly and Ethan would annoy me, I'm sure.